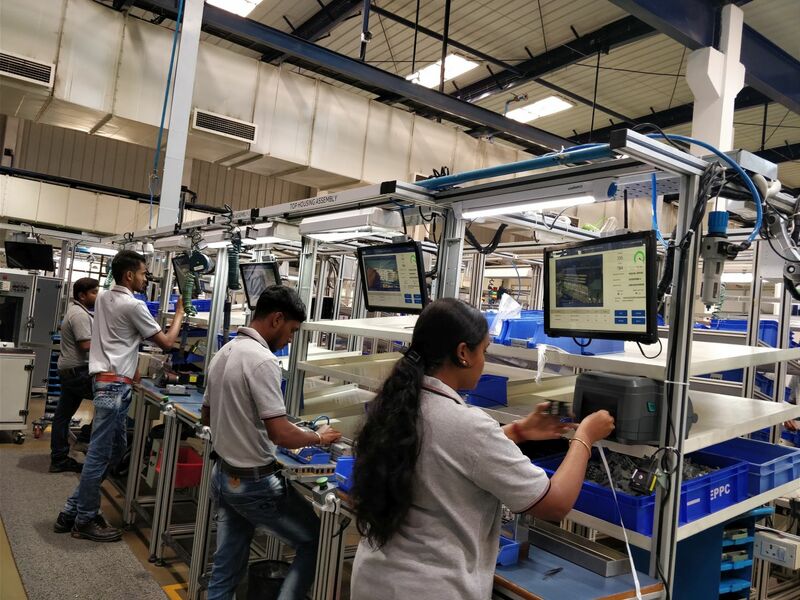 ABB India has inaugurated one of the first smart factories in Bangalore for the production of electrical protection and connection solutions. The facility will be located on the existing factory premises of Nelamangala in Bangalore, the start-up and IT capital of India. The smart factory enables continuous monitoring of the production process through visualization of operational data, to increase efficiency and flexibility of the manufacturing process. The smart production line can track and display operational performance parameters across the entire manufacturing chain in real time. The factory also has digital lifecycle management with interconnected automation components, machines as well as data about processes and products. Real-time feeds monitor the entire manufacturing process. Remote access and wireless communication with Radio Frequency Identification Devices (RFID) manage the production process, work orders and testing parameters. Taking the Make in India initiative to the next level of precision and smart technology, the newest member of the portfolio, Emax 2, includes product line features such as product assembly on track guided vehicles (TGV) powered by electric motors on a closed loop track. “ABB has continued to invest in building capacity to cater to the evolving trends in the Indian market and bridging them with best in class global technology. At ABB, we use smart technology to make solutions that help our customers get digital-ready,” said Sanjeev Sharma, Managing Director of ABB India. The smart factory, which is part of ABB’s manufacturing 19-acre Nelamangala campus, will house the production line for the entire range of ABB’s protection and connection business, which helps to protect power systems from surges and enables a reliable power supply for various installations. The Bangalore facility will manufacture ABB’s range of air and molded case circuit breakers, electronic and thermal relays, contactors, pilot devices and ABB’s latest range of plug and play low-voltage circuit breaker, Emax 2. The products are key in optimizing resources, reducing energy and life-cycle costs and boosting the productivity of industrial installations across sectors like process industries (cement, textile, chemicals, and metals), marine, data centers and automotive. Smart, connected factories are the future of manufacturing. ABB was instrumental in kick-starting the second and third industrial revolutions and is leading its customers into the Fourth, where machines and factories are connected and increasingly autonomous and self-learning. Today ABB is leading the way into the new era with a range of products and solutions under the name ABB Ability. The Ability platform leverages intelligence gathered from ABB’s vast global installed base of 70 million connected devices and 70,000 control systems and uses this intelligence to not only help the customers optimize operations but also uses the insights to develop new business models. ABB Ability currently has more than 210 solutions. “As digitalization gains traction across Indian industries, ABB’s smart factory will take the production of power equipment to the next level. Digital technologies enabling the manufacturing of various next-generation plug and play solutions will cater to a rapidly evolving market. Such world-class, smart facilities will be the stepping stone for the next level of growth for the nation,” Sharma said. “This smallest and feature-rich power circuit breaker results in space savings of about 25 percent and a reduction in assembly time by 10 percent with network analysis and preventive diagnostics powered by cloud connectivity for any installation,” Sharma added. India wants to increase the contribution of manufacturing to the nation’s GDP to 25 percent by 2020 from 16 percent. At the same time, India experiences an increase in adoption of cloud, mobility and analytics technologies that rely on computing and a storage infrastructure. Managing and controlling the power supporting these industry requirements will need new energy management platforms such as the Emax 2 system. The new line of manufacturing at ABB helps to meet these growing demands for energy management.